Is #newlaw finally here? According to the new 11th Annual Blickstein Group Law Department Operations Survey, published in collaboration with Consilio, 78% of law departments surveyed use alternative legal service providers. Not that long ago, there were only two ways to get legal work done – in-house or at a law firm. No more. 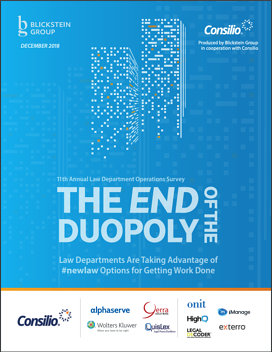 The 2018 LDO Survey reveals what law departments are using ALSPs for, plus insights on Artificial Intelligence, Technology Effectiveness, Alternative Fee Arrangements, and more than 100 additional data points. Download the Report and get the full picture of the Legal Ops landscape! By submitting your email, you are opting in to receive Above the Law Sponsored Messages.